Blockchain comes as one of the most misunderstood phenomena in the tech world, and if you still associate it with Bitcoin and cryptocurrency, you’ll be surprised by learning how various industries use the technology to streamline their processes. Healthcare industry is one of the early adopters of the blockchain. Medical and pharmaceutical companies’ data requires advanced security and anonymization, that’s why about 16% of healthcare providers are expected to implement the technology at scale, according to IBM latest research. They believe that blockchain will open the gates to new markets and new data, which they can securely use for their benefit. So, what are the key areas in healthcare that can make use of blockchain? Let’s take a look. Data access. Originally, EHRs weren’t designed to be multi-institutional, that’s why all the data is scattered across the country as a patient moves from one provider to another. As a result, people have some trouble getting access to the crucial information that they need in critical situations. Time delay. According to the HIPPA Privacy Rule, “providers can take up to 60 days to respond (not necessarily to comply) to a request for updating or removing a record that was erroneously added.” Do you want your sensitive information to be incorrect or missed? I guess, not. General data sharing and retrieval processes are difficult because of software cost. True to say, some IT developers charge the exorbitant amount of money for data exchange interfaces. That’s where blockchain comes into play to solve all of these problems. It shares the complex of health data between patients and providers without risk and records information into the virtually incorruptible cryptographic database where all sensitive data is distributed and maintained by a huge network of computers across the world (picture 1). Each patient has a unique identifier and an encrypted link to health records, so that they can decide with whom to share them. One of the latest examples of such implementation is MedRec, a decentralized system for electronic health records and medical research data developed by MIT Media Lab. According to the World Health Organization, 10% of drugs are counterfeit worldwide. In the developing countries, this number accounts for more than 30%. Counterfeit drugs may contain the original active ingredients but at the dose that is too low or too high, which is very dangerous for human organisms. The lifecycle of drug transaction is as follows: manufacture-wholesaler-pharmacist-patient. 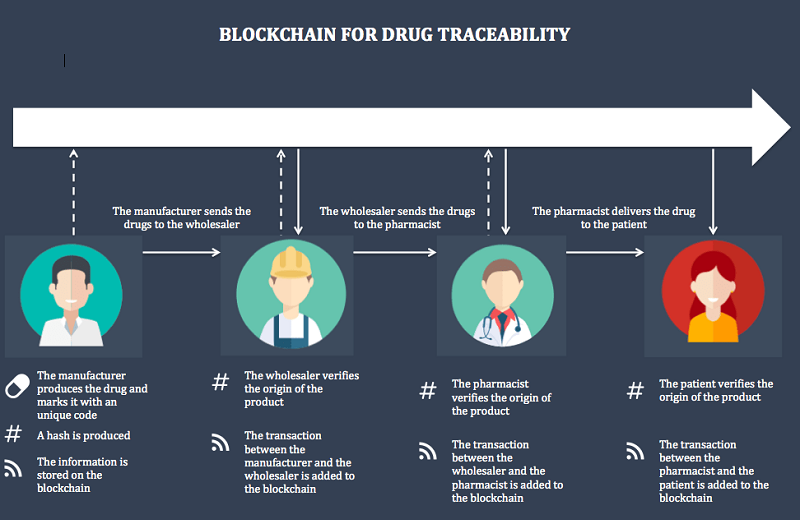 Blockchain tracks this flow between parties to secure drug’s product information (picture 2). Counterfeit Medicine Project, launched by Hyperledger is one of the latest examples of how the industry is trying to fight counterfeit medicine. Each produced drug is marked with a time stamp, which contains the information of when and where the medicine was produced. The provenance, constitution, and transfer of the product are recorded in the distributed ledger of blockchain and can be easily checked by anyone with the access. More than 50% of clinical trials stay unreported, according to the latest statistics. In essence, this leads to destructive consequences for both patients and providers. There is a high demand for clinical data on medical studies to close the existing knowledge gaps and leverage innovation in drugs manufacturing and population health management. All the information stored in EHR blockchain is non-identifiable and can be analyzed to gain new insights. The only way to discover the real data is to use the private key owned by the patient. That means that the data related to the patient’s visit to the doctor will contribute to the clinical trial without uncovering identity. It can’t but makes difference. MedRec goes beyond this idea and enables medical researchers and health care providers to mine in the network. In return, the mining rewards will anonymize medical data. This idea requires the special function in the Patient-Provider Relationship contract. MedRec plans future updates to the mining model where a miner can specify preferences for the kind of data they are looking for. Experts predict that by 2020, about 20-30 billion of connected medical devices will be used globally. At the same time, the number of the hacked medical devices rises exponentially, with more than 27 million of patients affected by the problem in 2016, according to the latest reports. Wearable smartwatches are playing the critical role in IoMT, with Apple Watch being the most selling wearable in 2017. The heart rate sensor installed on these devices allow users to track their motions, burnt calories and even prevent heart diseases. What if all of this data can be anonymously stored in blockchain databases and then used in clinical trials? No doubt, a huge breakthrough in population health management is waiting for us. The conflict with the existing EHRs and HIE (Health Information Exchange) systems. It’s obvious that the current ways of storing the information are well organized in many health organizations. From the technical point of view, the transition of all the data to blockchain may lead to many inaccuracies and errors. Standardization and disparate terminology issues. All the current systems are made in accordance with the laws and regulations of the specific countries. The distributed blockchain system should comply with these rules. Blockchain system brings a radically new way of thinking and understanding of how the whole healthcare industry should work. They say blockchain mirrors nature. 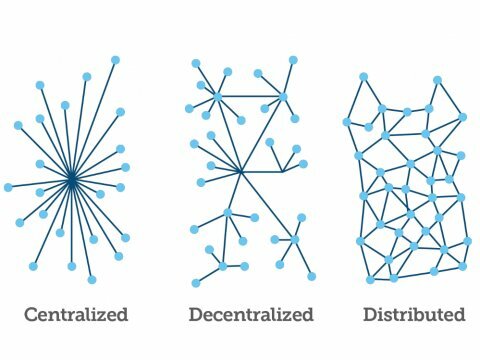 However, it is still not really clear how to implement this technology in the real world and there are still very few examples of real-life decentralized systems for healthcare. Here at Elinext, we are ready to uncover new insights into healthcare industry and put the power of blockchain into practice. Contact us to get the expert consultancy.